Agatha Christie's quirky Belgian detective Hercule Poirot could hardly have found a juicier whodunit  and in his home country, no less. The Case of the Skydiving Murderess had everything: secret trysts, subterfuge and a sabotaged parachute. However, this was no fictional mystery; it was real life. And the victim, 38-year-old Els Van Doren, perished in the most dramatic way: after leaping from a Cessna airplane at 13,000 ft. (4,000 m) to perform a routine with her skydiving club, she found her chute ropes had been cut. Plummeting to the ground at around 120 m.p.h. (almost 200 km/h), she crashed and died in someone's garden. Almost four years have passed since Van Doren's death. Since then, her involvement in a bizarre love triangle has come to light: a mother of two, married to an Antwerp jeweler, Van Doren was also sleeping with a Dutch member of the skydiving club, Marcel "Mars" Somers. And Somers was sleeping with another club member as well, Els "Babs" Clottemans, 26, a schoolteacher with a history of psychological trouble. Clottemans was eventually arrested, but it took until Wednesday, Oct. 20, after a four-week trial in the northern Flemish town of Tongeren, for a jury to find her guilty of premeditated murder. On Thursday, the court sentenced Clottemans to a 30-year jail term. The case has gripped Belgium, where a live television feed was set up from the courtroom. This is a country where crimes of passion are rare. The details of the love triangle, Clottemans' apparent raging jealousy and the spectacular death plunge seem to have more in common with an episode of CSI than the humdrum routine of life in Flanders  and locals wonder how long it will be before the inevitable Hollywood dramatization. Indeed, part of the crime is already caught on video. Van Doren's agonizing fall was filmed on her own head-mounted camera. She is initially seen jumping from the plane with Clottemans, along with Somers and another man. All seems fine when they link hands midair in a star formation, something they had done many times before. But when they release their hands at 4,500 ft. (about 1,400 m), Van Doren discovers that neither her main parachute nor her backup chute will deploy. In the chilling footage, she is seen frantically tugging at the straps, trying to open her parachutes before plunging to her death. Clottemans initially escaped attention during a first round of police questioning because of her friendship with the victim: in the 10 months before the incident, they spoke over the phone 200 times. But she became a suspect when she attempted suicide hours before she was to make a second statement to police. Yet despite the emphatic sentence handed to Clottemans on Thursday  just one notch down from life imprisonment  some still doubt her guilt. Throughout 100 hours of interrogation by detectives, she maintained her innocence. "They wanted me to confess. But confess to what? I couldn't confess, as I hadn't done anything," she protested during the trial. And although the jury found her guilty, there was no hard evidence to convict her: no confession, no witnesses, no fingerprints or DNA. Not even an incriminating knife or pair of scissors. But she does appear to have had the motive and the opportunity. Prosecutors said Somers was sharing his bed on Friday nights with Clottemans and on Saturdays with Van Doren. They stated that on Nov. 10, 2006, a week before the murder, Clottemans was staying at Somers' home in the southern Dutch city of Eindhoven when Van Doren showed up. Prosecutors claimed that Somers then took Van Doren upstairs to bed, while Clottemans was kept downstairs on a mattress in the living room. They argued that Clottemans could hear the pair making love through the thin walls. Somers' parachutes were in the hall, and it was alleged that Clottemans  consumed by jealousy  took that chance to interfere with them. Investigators found that the straps of both Van Doren's main and reserve chutes had been cut. 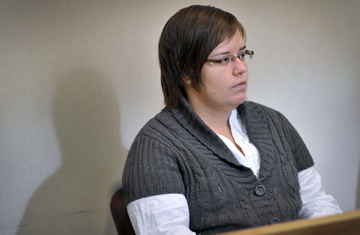 The jury also heard a damning portrait of Clottemans' emotional state. A report by three psychologists depicted her as "deeply psychopathic" but able to maintain a facade. She was "cold and without emotion," they said, and "a danger for society." She was described as being deeply disturbed by her father's death when she was 2 and having sought psychological help after a suicide attempt at the age of 16. Testifying via video from the Netherlands, Somers suggested that Clottemans was unable to cope with his relationship with Van Doren. "When Els and I went to bed, Babs kept turning it over. Something cracked," he said. "She took a pair of scissors and cut the parachute cords. For me, that's the most realistic scenario." Prosecutors accused Clottemans of sending anonymous letters to Van Doren and making anonymous phone calls. Another member of the parachute club in Zwartberg, just 20 miles (32 km) from the Dutch border, described Clottemans as a "drama queen." The judge said the only mitigating circumstance was Clottemans' unstable mental condition. But Clottemans' attorney, Vic Van Aelst, argued that this failed to meet legal tests. "There is not a shred of hard evidence to justify locking somebody up in a cell for the rest of her life. Only a lot of hocus-pocus," he said. "This has become an extraordinary public debate, because everyone is asking, 'Did she or didn't she do it?' " says Gert Vermeulen, head of Ghent University's department of penal law and criminology. "But you have to ask to what extent largely circumstantial evidence can be used to convict a person. Motive and opportunity are important, but if they were the only elements, I would not convict the person." Most Belgians following the trial agreed with the jury that the evidence  however circumstantial  pointed to Clottemans' guilt and accepted the court verdict as fair. However, unlike in Hercule Poirot stories, this is one case that did not end with a confession by a cornered killer. See how Belgium has been rattled by a crime wave. See more on Belgium's Catholic Church.